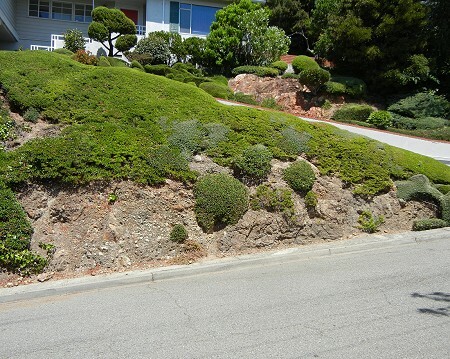 Geranium Place occupies a sloping bit of land just north of Horseshoe Creek below Redwood Road. 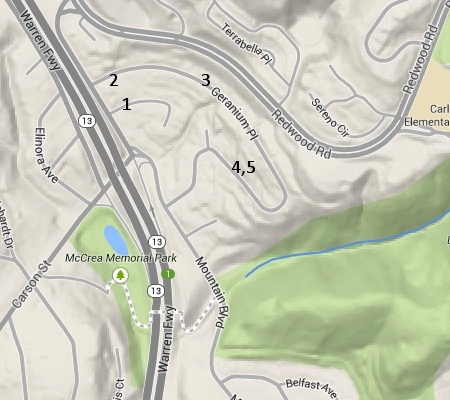 This map shows the location plus the sites of the photos in this post. The bedrock here is mapped as Franciscan melange on the west and the Leona volcanics on the east, the same stuff exposed in the huge Leona Quarry just down the Warren Freeway. The rocks I saw were clearly the latter, but you have to take the lines on the geologic map as approximations. If I’d been there fifty years ago when the homes here were being built I might have been able to tell better, while the foundations were exposed. BUT! there is bedrock to look at in any case. The first thing that caught my eye, though, was the gutters. What’s going on here? Iron-rich runoff like this is not expected from undisturbed land. I think the area was once a borrow pit or small quarry. Across Horseshoe Creek is the big quarrying operation above Laundry Canyon, and just beyond is the notorious McDonell sulfur mine site, so naturally the resemblance to the nasty-looking streambed down there is striking. What etched away the cement in the gutter? My best guess is acid drainage. The white crust is another clue. In our deathly dry conditions it might conceivably have been salt, but it had no taste when I nibbled a fragment of it. It’s probably either gypsum or carbonate; without any chemicals handy I couldn’t learn anything more. 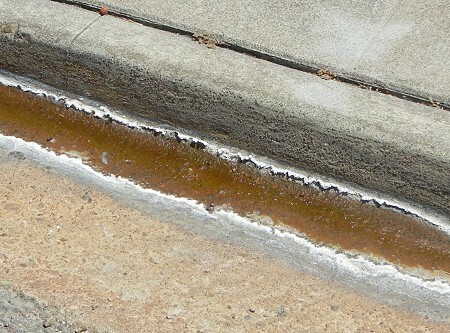 But a buildup of crystals like this could gradually disintegrate the cement in the gutter. 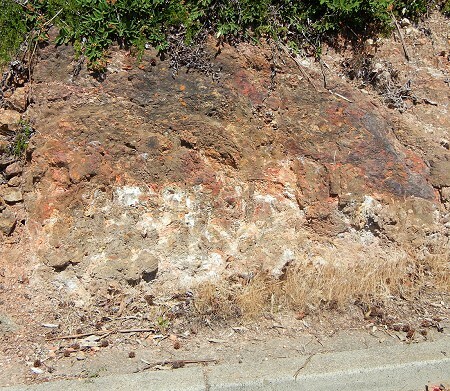 It may also be seepage from the serpentine exposed along and above Redwood Road here. In sum, very hard water here, but probably not nasty water. The bedrock is heavily iron-stained and chewed up. Being so near the Hayward fault (it grazes the lower left corner of the map area) surely accounts for that. Some of the households here have worked with it to good effect. This is breccia—pervasively shattered rock—that has been abraded by tectonic shearing so the pieces are rounded, as if you took crushed rock and rubbed it between your hands with a giant’s strength. It’s fairly well cemented, not crumbling apart, so this process happened at some depth. At the northernmost bend of Geranium, up against the highly cantilevered Redwood Road, the ground is empty and there are monitoring wells of some sort. We have deeply disturbed this area. 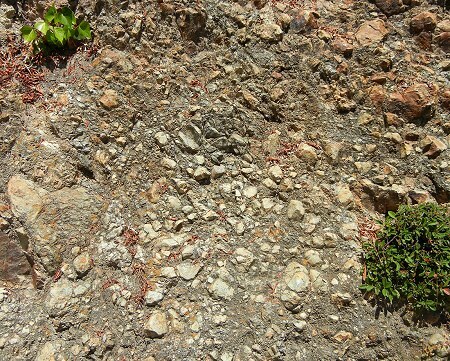 This entry was posted on 27 July 2014 at 9:08 pm and is filed under Leona volcanics, Oakland geology puzzles. You can follow any responses to this entry through the RSS 2.0 feed. You can skip to the end and leave a response. Pinging is currently not allowed. 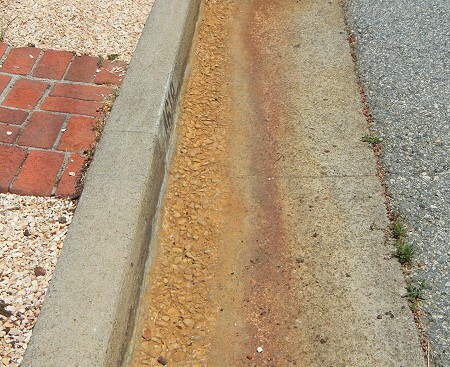 There was a history of mining in this neighborhood, and a lot of the natural gullies were in-filled, which might explain why there is groundwater flowing. When we here house hunting a few years ago, we looked at one of those houses on Geranium just past the open area. Two things about the house completely freaked me out: first, the whole house was sloping down toward Geranium, and second, Redwood Road loomed above the house and it all looked like it could come sliding down any minute. I know we are all in the same boat when the big one comes, but I wouldn’t want to be in that particular spot of the boat! Do you mean that the floors weren’t level? That’s a definite no-no. Yes! We have some sloping floors in our house too–don’t most old houses settle unevenly a bit? But the one on Geranium was drastic. The front porch and all the rooms along the front of the house were very obviously slanted down toward the street. The agent we had at the time (not the one we went with in the end) acted completely unconcerned about it, too. I’m sure they prefer to stay ignorant about what’s going on under/around all these houses!